ANAHEIM, Calif. – There aren’t six words more sodden with anticipation and angst in sports. Or a moment as pregnant with the prospect of either wild realization or crushing despair. It’s not the eve of a championship. That’s something wholly different. The stages of the NCAA Tournament and its three-week psychodrama make for something of an extended cattle-call audition anyway. That there are two distinct prizes – the championship itself and, before that, inclusion in that last grouping – is something unique in sports, providing consolation, if not actual comfort. You’ve won three knockout games and you’re one of just eight teams left in contention, yet still you have a limited cachet. You’re still, well, more of a participant than an achiever, at least in the popular perception. And if you’re not the team moving on after that 40 minutes, it’s simply cruel. Gonzaga grasped that hard reality four years ago and changed a narrative a couple of years later. As Texas Tech will try to do on Saturday at the Honda Center against the Zags in the West Region’s Elite Eight game – after falling to Villanova in the same round a year ago. But the summer doesn’t matter now. Only the 40 minutes matter – “the opportunity in front of us,” as Zags forward Jeremy Jones put it. Only one Gonzaga team has made it happen at this stage: the 2017 Bulldogs. 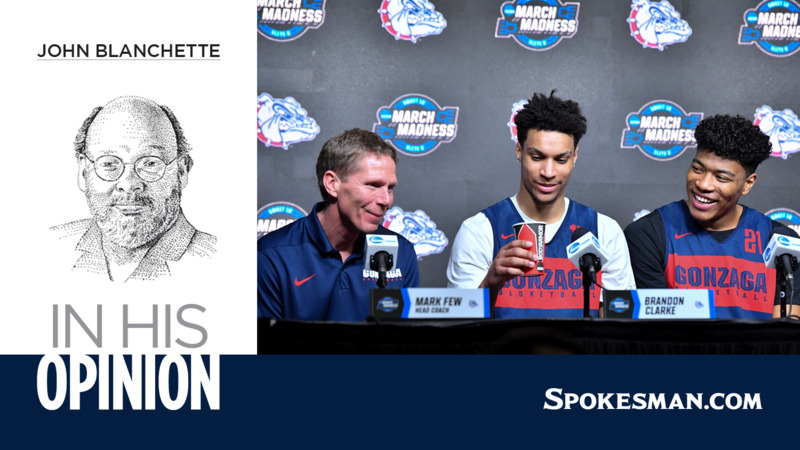 In 2015, the Zags returned to the Elite Eight for the first time since the godfathers of 1999 got this ball rolling, and while they had top-seeded Duke in a tensionfest with 7 minutes to go, there wasn’t a sense that a Final Four was going to happen. Veterans, leadership, versatility, toughness, depth – the 2017 team had it all. “It felt like we were on the cusp of a breakthrough, and everybody on that team knew how special that would be for the program, the school and for Spokane,” Michaelson said. It was that Gonzaga team that cashed in the chit for all the previous Zags who didn’t get to the Final Four – and the ones who busted it in the old Kennel, who never flew on a charter flight, who wore the old uniforms with short sleeves. That’s how the hunger grew – through all that dues paying. Texas Tech coach Chris Beard gave a funny insight Friday into why those with a scuffler’s history so treasure the opportunity of which Jones spoke. It dated to Beard’s days as a junior college coach, when he and some buddies made their way to a Final Four as spectators, sniffing around a hotel looking “for a free buffet or something” when they bumped into radio personality Jim Rome. “He was like ‘Where y’all from?’ and we told him the story – we’re at the Final Four and we’d driven all night and were looking for something to eat,” Beard recalled Friday. “He gives us his key and says, ‘Hey, man, I’m on the top floor – do not go in my room – and there’s a concierge there. Go up there and hit it.’ I will never forget it. They had prime rib sliders and little Ozarka waters and granola bars. We killed it, man. And Beard’s Red Raiders are hungry. They’ve never been to a Final Four – last year’s 12-point loss to the eventual national champ was the school’s nearest miss. They lost in the 2005 Sweet 16 – right after eliminating Gonzaga in a two-point game (Beard as an assistant to Bobby Knight then) – and four other regional semis. That weights the moment, for sure. But Beard uncovered more subtle stakes, too. Because then it’ll sink in. Published: March 29, 2019, 9:14 p.m. Updated: March 29, 2019, 10:38 p.m.